Digital Dining has more flexibility with integrated credit & debit processing for both over the counter quick service or table service restaurants than ever before. No matter how your customers choose to pay for purchases, Digital Dining empowers merchants by providing fast, secure, integrated credit & debit with major electronic payment processing companies. When you partner with Armagh, lightning fast transaction times, reduced possibility for errors, and less reconciliation labour are all within reach. We believe restaurant owners should have choices and not be locked into a single credit card processor. 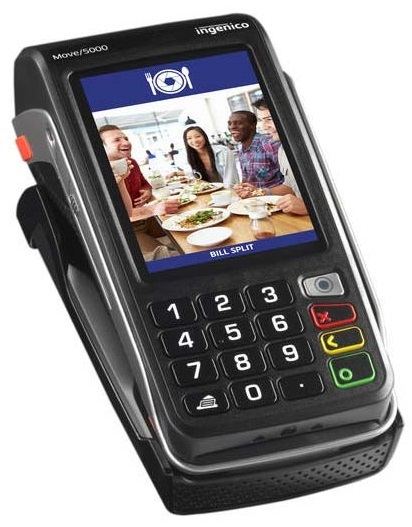 That’s why Digital Dining offers a variety of Canadian EMV Chip & Pin and NFC Tap (Near Field Communication) enabled payment processors to choose from: First Data, Global Payment Systems, Moneris, and World Pay. Restaurants using Digital Dining can provide easy payments for their guests with secure integrated wireless Pay at Table. Integrated Pay at Table enables the service staff to recall tables and checks on the payment pinpad, and as checks are paid down, they are automatically closed on the Digital Dining POS system. Integrated wireless Pay at Table also supports contactless Tap & Pay NFC payments, including Apple Pay. “Future-proof” your integrated payments with secure EMV payment functionality and NFC Tap & Pay, the most secure payment processing methods available on the market, including Apple Pay. Digital Dining also offers integration with P2PE / E2EE (Point to Point Encrypted / End to End Encrypted) payment solutions which are the next generation in secure integrated payments. These solutions offer transactions that occur “out of scope” allowing card data to remain segregated from the merchant’s business network, while still allowing the POS system to control and manage the payments process. This kind of advanced integrated payments technology is the sort of thing that you can expect from Digital Dining POS. Digital Dining is certified PA DSS compliant by the PCI Security Standards Council. PCI compliance is ever-changing but critically important. That’s why Armagh has committed to a 100% QIR Certified technical team focused solely on security and compliance issues.